The mosquitoes crawled up our sleeves, under our trousers. One’s face would blow up from the bites. At the work site, we were brought lunch, and it happened that as you were eating your soup, the mosquitoes would fill up the bowl like buckwheat porridge. They filled up your eyes, your nose and throat, and the taste of them was sweet, like blood. For the occasion, the Solovki administration had spruced up the camp, painted walls, planted trees, allowed husbands and wives to be together (as they never were ordinarily). And, as it turned out, Gorky failed to see beyond the façade that had been erected for him. He seemed disinclined to try. He visited the punishment cells and, after a few short minutes, pronounced them “excellent.” He spent hardly any time at all with prisoners, though he did speak for forty minutes with a young boy and declared himself fascinated and pleased. (After Gorky left the camp, Likhachev writes, that boy was never seen again.) The writer stayed for three days and spent nearly all of it with the secret-police officers who ran the complex. In a new book, “Gulag: A History” (Doubleday; $35), Anne Applebaum, an op-ed columnist at the Washington Post, provides an ambitious and well-documented survey of the forced-labor system from its inception until its elimination under Gorbachev. (“Gulag” is an acronym for Glavnoe Upravlenie Lagerei, or Main Camp Administration, but it came to mean, simply, “camp,” or, more generally, “the camps.”) Applebaum’s book is invaluable not so much for the facts it uncovers but, rather, for the extraordinary care with which they are assembled. She draws on an impressive range of sources—camp memoirs, literary works, archival material, personal interviews, and histories in a variety of languages. Although no book on the camp system can ever eclipse Aleksandr Solzhenitsyn’s “The Gulag Archipelago,” there is surely a place for a comprehensive, popular history such as Applebaum’s. At any sizable bookstore, there are dozens of historical works on the Holocaust—beginning with Raul Hilberg’s magisterial three-volume work, “The Destruction of the European Jews”—and far fewer on what one of the characters in Milan Kundera’s “Ignorance” archly labels the “evil number two” of the twentieth century. The Holocaust has been approached from so many angles of scholarly inquiry and at so many artistic levels—from Anne Frank to Primo Levi, from Claude Lanzmann to Steven Spielberg—that it is impossible to plead ignorance, except willfully. The literature of the Gulag, though also rich, is far less familiar to the public. A survey like Applebaum’s is welcome. The concentration camp, as both a term and a concept, has complicated beginnings. It was first used to refer to a form of incarceration, when the Spanish military during the Cuban insurrection, Americans in the Philippines, and the British during the Boer War established what were called “concentration camps.” These camps were harsh places, where many prisoners died, but they did not begin to suggest the horror that “concentration camp” would soon convey. Lenin and Trotsky began using the term kontslager in 1918, during the civil war, with Trotsky initiating construction of camps to house Czech soldiers fighting Bolshevik forces in Siberia and Lenin calling for their use to sequester the kulaks, wealthier farmers with hired hands. The Resolution on Red Terror, issued later that year, provided for the “safeguarding of the Soviet Republic from class enemies by means of isolating them in concentration camps.” The idea was to separate, suppress, or destroy “categories of individuals”—priests, landowners, and other “enemies of the Revolution”—and to begin creating a pool of slave labor. Construction began in 1919. By the end of 1920, Soviet Russia had eighty-four camps, with around fifty thousand prisoners; within three years, the number of camps had quadrupled. What Lenin initiated, Stalin expanded. The Gulag “metastasized,” as Solzhenitsyn put it. All in all, the system had four hundred and seventy-six camp complexes; within each complex there were often dozens, sometimes hundreds, of smaller camp units, called lagpunkts. From 1929 until Stalin’s death, in 1953, eighteen million people passed through the camp system, both political prisoners and common criminals. Six million more were exiled to isolated, well-policed villages in the Siberian forest or the Kazakh desert, or to spetsposelki, special settlements. Under Khrushchev, Brezhnev, Andropov, Chernenko, and Gorbachev, the stream of “politicals” into the camps slowed, but it did not stop completely until the collapse of the Soviet Union. Where was the Gulag? It was everywhere. There were camps not only in the frozen wastes of the Siberian north and in the Far East but in every corner of the empire, including the biggest cities. When I was living in Moscow as a newspaper reporter, during the Gorbachev-Yeltsin era, a few of my Russian friends lived in apartments built by prisoners. (One prisoner who worked on a Moscow construction site was Solzhenitsyn; the building still stands, on Leninski Prospekt.) In other cities, what are now called apartments were once camp barracks. The Gulag, in a sense, was inscribed into the country as a whole. Enormous regions of the Eurasian landmass, particularly the north and east, were colonized through the establishment of camps. In the Komi region, cities such as Ukhta, Syktyvkar, Pechora, Vorkuta, Inta, and many others either barely existed or did not exist at all until they became camp centers. Stalin hoped to use the camps to help industrialize the Soviet Union. He even thought that the Gulag could be run as a profitable enterprise, though it never was. The architecture of terror is a costly thing. And yet, in what had been a largely peasant country, prisoners built roads, railways, dams, and factories; staffed steel mills, coal mines, ironworks, oil fields; cleared forests in Komi, fished salmon off Sakhalin, slaughtered livestock in the Caucasus. As Applebaum writes, Gulag prisoners made everything from missiles to “mechanical rabbits playing drums.” At Stalin’s order, prisoners even built preposterous public-works projects: rail lines that cut through the forest and then were abandoned when Stalin died; dams to reverse the direction of rivers; canals that proved useless. Prisoners equipped with nothing more than shovels, saws, picks, and wheelbarrows dug an infamous canal between the Baltic Sea and the White Sea; thousands worked themselves to death and were buried in the banks. The leadership published a book extolling the greatness of slave labor and the White Sea Canal. Its editor and principal author was Maxim Gorky. “Gulag: A History” is structured in three parts: the origins of the camps; the experience of the zeks (prisoners), from arrest until death or release; and then a history of the decline of the “camp-industrial complex” until its final collapse, under Gorbachev. Applebaum is a deft synthesizer of both the better-known works and the more obscure, yet astonishingly vivid materials that remain, for the most part, untranslated. Her portrait of the politics of the era is straightforward and sufficient for her survey; the book’s emotional power is in her portrait of the victims and what they endured. Through copious quotation and anecdote, Applebaum methodically, and unflinchingly, provides a sense of what it was like to enter and inhabit the netherworld of the Gulag. From the sources she has assembled, we learn what the daily soup was made of (“spoiled cabbage and potatoes, sometimes with pieces of pig fat, sometimes with herring heads” or “fish or animal lungs and a few potatoes”); the regulation height of the camp fences; the dimensions of the barracks; how women made buttons from bits of chewed bread, sewing needles from fish bones. The Gulag was a universe with its own languages and codes, and we get a sampling of them: for camp administrators, pregnant women were “books,” women with children were “receipts,” men were “accounts,” exiles were “rubbish,” prisoners under investigation were “envelopes,” a camp division was a “factory.” We learn about the tattoo designs for politicals, addicts, rapists, murderers; we learn of tufta, the art of pretending to work, and of mastyrka, the art of malingering. The slang of the Gulag eventually became the slang of the entire Soviet Union; the rich vocabulary of Russian obscenity developed mainly in the camps. We learn the telegraphic system—the “alphabet”—used by one prisoner tapping on a cell wall to communicate with another. 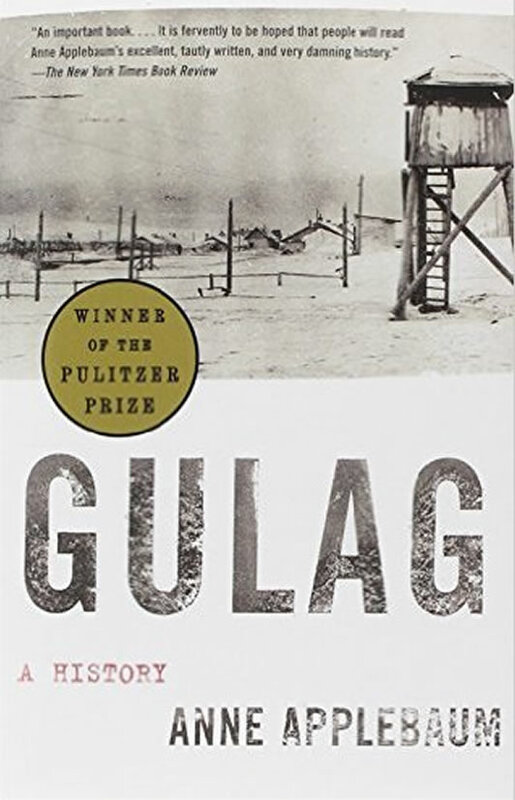 Applebaum, like any intelligent writer who encounters the subject of the Gulag, gives credit to Solzhenitsyn and “The Gulag Archipelago.” It is impossible to name a book that had a greater effect on the political and moral consciousness of the late twentieth century. Not only did Solzhenitsyn deliver the historical truth of the Gulag; he conveyed, as no one else did, its demonic atmosphere and the psychology of both the prisoners and the guards, as well as the mark it left on the entire society. In fact, if Applebaum’s “Gulag” leads more readers to Solzhenitsyn then her book will have served an important function. It is not disparaging to Applebaum to say that the relation between the two works is like that between a history of the Trojan War and the Iliad. “The Gulag Archipelago,” which was published in the United States by Harper & Row, in three volumes, between 1974 and 1978, was a best-seller, a sensation in the press. It seems a fair guess that hundreds of thousands of copies of “The Gulag Archipelago” sold at the time went unread. Countless copies of Volume 1, its jacket the color of wet cement, sat as still as cinder blocks on the bookshelves of earnest purchasers. Nevertheless, in some countries, particularly France, the book was the decisive event in exploding the lingering illusions of the left about the nature of the Soviet era. Many factors contributed to the collapse of the Soviet Union—an antiquated economy, a senseless political system incapable of modernizing—and surely the publication of “The Gulag Archipelago” was among them. Solzhenitsyn, who had been a prisoner for eight years, first began making notes for such a project in 1958. With Khrushchev’s sanction, he was able to publish his novella “One Day in the Life of Ivan Denisovich” in the mass-circulation journal Novy Mir, in 1962, and old zeks began to write him letters filled with information about life in different camps. He received letters not only from ex-prisoners but from ex-guards, and even ex-secret policemen. He also travelled widely and furtively, visiting friends from his own days in the camps and other witnesses who bravely told him their stories. Working between sixteen and twenty hours a day, Solzhenitsyn finished the book in 1968 but kept his copies of the manuscript hidden. On September 1, 1973, Solzhenitsyn learned that the Leningrad K.G.B. had confiscated a copy of the manuscript; his devoted typist, Elizaveta Voronyanskaya, had been interrogated by the K.G.B. and had told of a copy that she had buried at a friend’s dacha. Shortly after her arrest, she was found dead of asphyxiation—a suicide. Solzhenitsyn no longer had any choice: he sent a signal to his confederates abroad to publish in the West. Just before the new year, YMCA Press, in Paris, published “The Gulag Archipelago,” in Russian. Solzhenitsyn heard the news on the BBC while eating lunch. “I heard the news calmly,” he writes in his memoir “The Oak and the Calf,” “and continued forking cabbage into my mouth.” Solzhenitsyn, who had been awarded the Nobel Prize in 1970, was soon arrested by the K.G.B. and exiled to the West. The Soviet camp system was not the relatively high-tech factory of death that the Nazis put in place at Belzec, Chelmno, Sobibor, Treblinka, Majdanek, and Auschwitz-Birkenau. There were executions in the Gulag, usually a pistol shot to the back of the head; sometimes exhaust fumes were used to asphyxiate prisoners. But, as Applebaum reminds us, the difference was in intention: “The Soviet camp system as a whole was not deliberately organized to mass-produce corpses—even if, at times, it did.” After the occupation of Poland and the Wannsee conference of January, 1942, the main purpose of the Nazi camps was the eradication of the Jews. Stalin intended something else. Using the Gulag, he meant to build a state and hold it in a permanent condition of terror. For a generation, he succeeded. The Nazi extermination project came to an end, of course, because of military defeat. What followed was a long and complicated process of “de-Nazification.” The memory of the war, and of the Holocaust in particular, has come to play an enormous role in Germany’s consciousness and politics. Nearly sixty years after the fall of the Third Reich, Berlin’s most celebrated building is its Holocaust museum. Such books as Daniel Goldhagen’s “Hitler’s Willing Executioners” and Victor Klemperer’s wartime diaries are best-sellers and are obsessively debated. In the post-Soviet world, by contrast, almost no one seems to care about the victims of the old regime. After 1991, there were no “truth commissions,” as there were in South Africa and Argentina. The Russian government under Yeltsin did organize a trial of the Communist Party, but it drifted into irrelevance; its verdict went unnoticed. Solzhenitsyn, who returned to Moscow after two decades of American exile, is mocked by much of the liberal intelligentsia; in today’s Russia, the readership of “The Gulag Archipelago” is no greater than it is anywhere else. There are a few groups, notably the Memorial Human Rights Center, that do serious work on camp archives. But their popular effect is almost nil. In August, 1991, after the quick collapse of a K.G.B.-led coup, demonstrators gathered outside the Lubyanka at a huge statue of Lenin’s secret-police chief, Feliks Dzerzhinsky. From a crane, a noose was lowered around Iron Feliks’s neck and the statue was dragged away. This was the singular picture promising a new epoch. Not long afterward, the Memorial brought a large stone from Solovki to a spot outside the Lubyanka. At a ceremony, a group of activists dedicated the stone to those killed during the Soviet repressions. If I remember accurately, there were no more than a hundred or so people there, and the coverage in the Russian press was fleeting. A decade later, little has changed. Occasionally, a new statue or plaque is dedicated at a camp or a mass grave, but millions of the dead remain as anonymous and as unremembered as they were in Stalin’s time. President Vladimir Putin, a former colonel in the K.G.B. who is wildly popular for having guided the country to some semblance of economic stability, does not hesitate to pay tribute to the wartime heroism of Josef Stalin. Last month marked the fiftieth anniversary of Stalin’s death. There were many articles and television programs, but none focussed much on the Gulag and its victims. According to the most reliable polling organization in the country, fifty-three per cent of the people believed that, “in the life of our country,” Stalin had played a predominantly positive role.